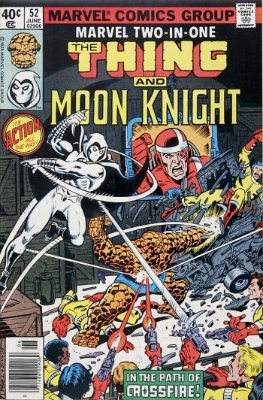 Sorry about the mix-up -- I sometimes get Meryl Streep confused with Holly Hunter, so it should come as no surprise that I confused Marvel Team-Up #52 for Marvel Two-in-One #52. Here is the final tip as it SHOULD have appeared in today's newsletter. I sincerely hope you didn't rush out to buy 50 investment-grade copies of Team-Up #52! There are very, very few sales of graded examples. Just one in 9.8 for $200 and one in 9.6 for $105. Some raw copies are showing up on eBay for around $50-75 in NM. This means it's a VERY speculative book. I am a bit worried and recommend you proceed with caution on this book. 9.8 or 9.6 only and don't over-commit. Should Crossfire become a major antagonist in the future, then you should see very respectable returns on this book. And it's cheap enough to be an affordable gamble. 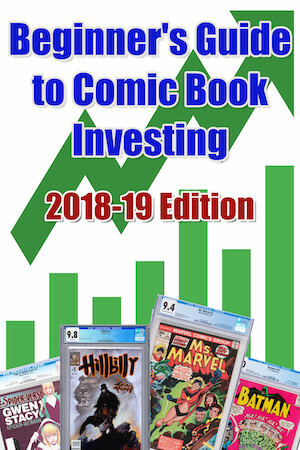 If you are interested in investing in comic books and have not yet checked out our eBook, then it's high time you did. We tip more than 30 books which should out-perform the stock markets, if you can grade well from eBay scans. Each includes a sales graph, historical data and target price points. Enjoy This? Please Pass it On! If you found this newsletter useful, or just fun to read, and you know other people who might feel the same way, here's how you can help. Please click to Share This Newsletter on Facebook, mention it in an email to your friend, or post on your favorite comic book forums and user groups! Missed some? Our back issues can be found here.